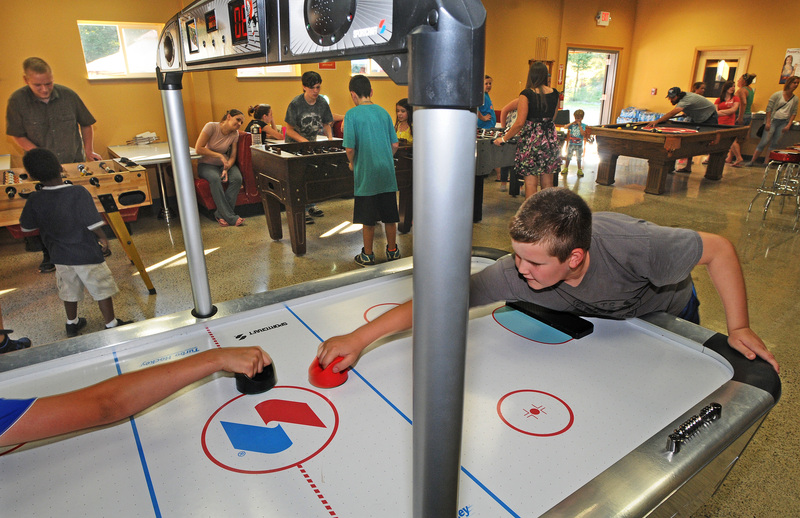 Gage Gehrke, 10, plays a game of table hockey at the Red Barn Youth Center on the Key Peninsula. The youth center has been a community dream for nearly a decade until it opened its doors this week. Peter Hedin wondered nearly a decade ago if children would come if the community built a safe place for them to hang out. Years of building support and a generous donation later, the Red Barn Youth Center opened its doors to parents and children from Peninsula Middle School yestrerday evening to showcase the Key Peninsula’s only after-school facility. A beaming Olivia Gehrke, 11, agreed wholeheartedly. 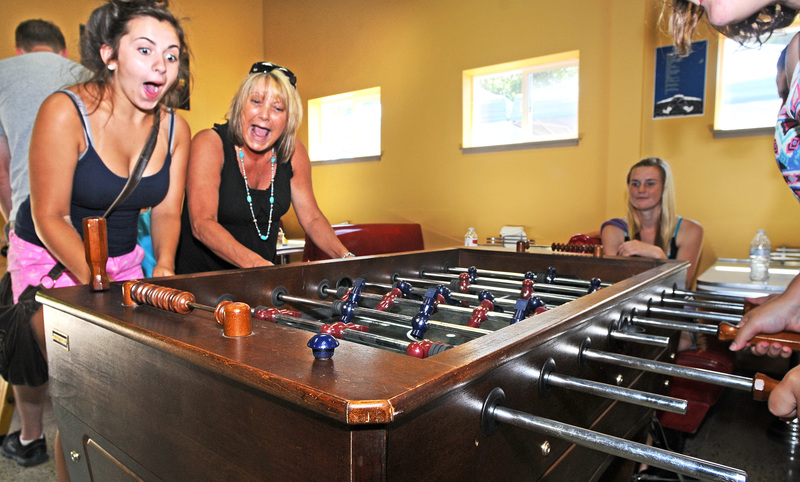 Hannah Baker, left, who is visiting from Albany, Ore., enjoy a spirited game of foosball with her aunt and friends Aug. 10 during the Red Barn’s community open house. Tonight, parents and students from Peninsula High School will take their turn, trying out the pool, foosball and table hockey games and taking a tour of a back room that will one day house a basketball court and performance stage. The youth center officially opens Sept. 3, the first day of school for the Peninsula School District. Getting the facility into working shape took years of herding community groups, raising more than $200,000, working with Pierce County on getting the proper permits and mobilizing an army of volunteers to help clean up the place, Hedin said. Tuesday night, dozens of children lined up for hotdogs and coleslaw at the 4,650-square foot facility a short walk from Key Center. “It has taken a long time to get here, but we’ve arrived,” said Glen Ehrhardt, a member of the Red Barn board. The journey began in 2004 when congregants at Waypoint Church asked the community for help building a safe place for children, according to Red Barn board member Doug Paterson. Hedin said the Red Barn board has plans to expand the use of the facility, eventually giving other organizations like 4-H clubs a venue to meet. A back room in the 4,650-square foot facility will be converted into a basketball court one day. 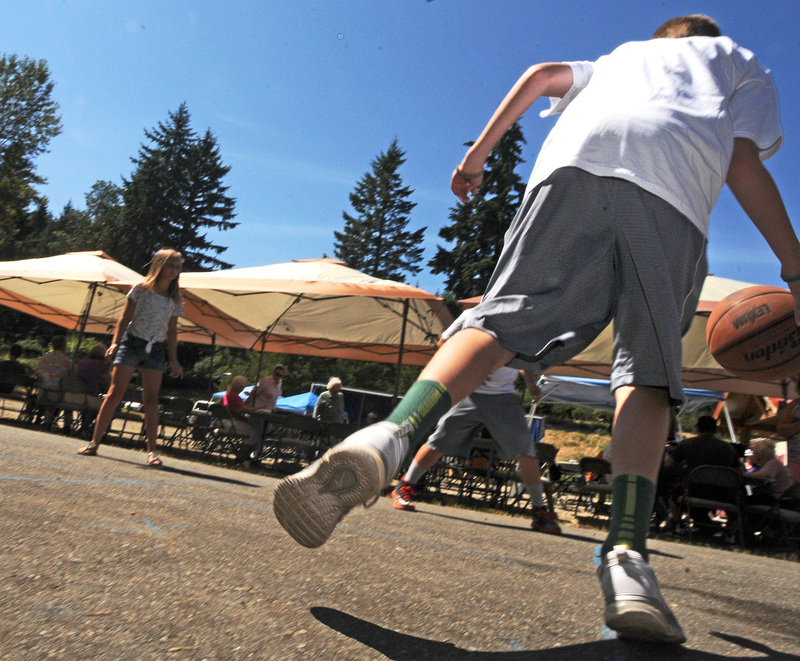 In the meantime, a hoop on the driveway was just fine for a group of kids at the open house Aug. 10. George Russell, who built Russell Investments, leased the property to the group for $1 dollar a year, jumpstarting their quest, Paterson said. The lease has since been modified to $50 a month and includes the maintenance of the building. Hedin said the bulk of the cost of getting the center opened was paid for by local donors.